today, we'll hear from mr. khamron sambunnanon, singing songs of crooked politicians and ganja madmen! 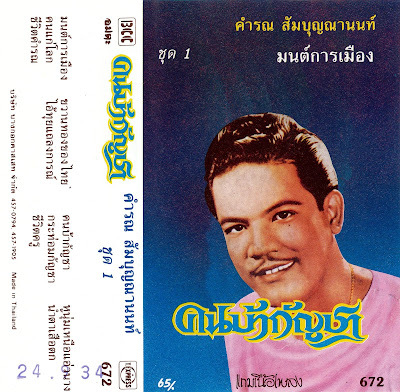 hailing from bangkok's chinatown, khamron sang what were called at the time phleng talat ("market songs"), as his lyrics were among the earliest examples of thai pop music to feature tales of common people; farmers, day laborers, and even more marginal figures like gamblers, vagrants, outlaws and drug addicts. because of this, khamron is considered by many to be the very first singer of luk thung, and many of the great luk thung stars of the 60s and 70s fondly recall singing along to khamron's songs during their formative years. 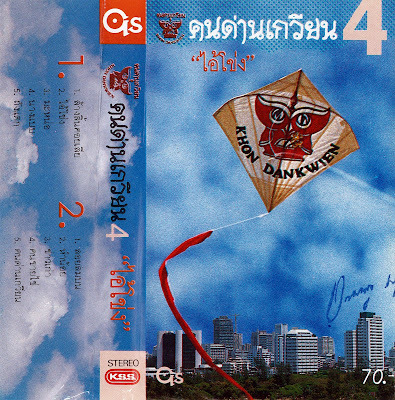 this album, from the bangkok cassette co., ltd. (currently existing as maemaiplengthai), contains several songs that i've shared before on various collections over the years, but once again shouldn't hurt.. enjoy! this week, some classic thai rock music, courtesy of the khon dan kwian band! fronted by "siphueak" isara anantathat, a native of bueng kan, khon dan kwian were among the first wave of prominent phuea chiwit groups. phuea chiwit or "songs for life" is a genre of (usually) politically engaged popular music, with roots in thailand's 70s protest movement and a musical grounding in anglo/american folk-rock from bob dylan to traffic. siphueak, a veteran of the 14 october 1973 popular uprising and the communist party of thailand, founded the band in 1983 and together with the legendary carabao helped bring phuea chiwit music to the mainstream, blending their international folk-rock origins with luk thung's latin dance rhythms and indigenous melodies. this cassette features their fourth album from 1987. enjoy! this week, the famous northeast fiddle sound of thonghuat faithet! hailing from mahasarakham province, thonghuat left school at the age of 14 to train under somphon naksiso, or "mo so", a master of the northeastern so fiddle in the employ of the pathumrat mahori orchestra of roi-et. thonghuat developed a uniquely expressive style, imparting a voice-like quality to his playing that was said to make the intrument "laugh" or "cry". 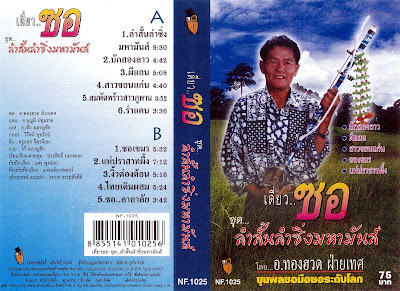 he became a sought-after studio musician (particularly for the label uea ari) appearing on tracks with luk thung singers and molam alike and recording many of the most iconic fiddle lines in thai popular music1. for more information on achan thonghuat, check out the compilation diew sor isan from zudrangma and em records, with liner notes by chris menist! 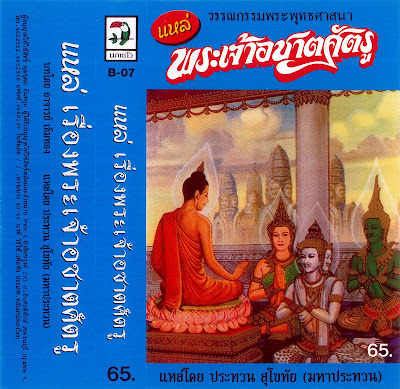 in the hopes that everyone will pardon a long holiday break, we're back today with a personal favorite of mine: fantastic lae from prathuam sukhothai! this one is a bit unique in my collection: i've heard plenty of completely unadorned lae, and plenty of pop-lae (à la waiphot phetsuphan), but i haven't heard much of this particular style; with a half-sung/half-chanted vocal line and piphat backing. the text, written by achan khaemthong, concerns the story from the samaññaphala sutta of king achattasattru (ajatashatru), an early buddhist convert. no biographical info about mr. prathuam was forthcoming, so if you have any please share! in the meantime.. enjoy!